Kids in the Kitchen | Winners Drink Milk! I can’t think of a better time of year to cook with your kids. With the holidays around the corner, there are so many delicious and easy recipes that kids can help with in the kitchen. 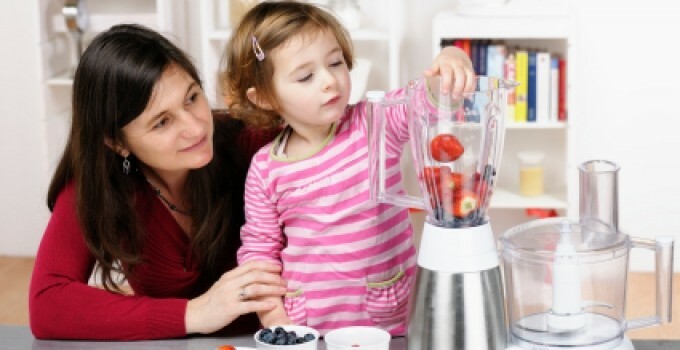 Include your kids in the whole process, from shopping for the ingredients at the grocery store to prepping the ingredients and putting it all together. Of course, kids will also always enjoy ‘taste testing’ the end product. I’ve compiled a couple of simple, kid-friendly holiday recipes that are both nutritious and delicious! An easy appetizer that everyone will love! For a variation, divide the mixture to make mini-cheese balls and us extra pecans and green onions to decorate them to look like ornaments. Mix together Cheddar cheese, cream cheese, mayonnaise and onion. Form ball and roll in pecans. Cover and chill overnight. Recipe created by Laurie Stanton, Moms Advisory Panel member and mother of two. A perfect breakfast for overnight guests or a great dish to have on hand for Christmas morning. Plus, its lactose intolerance friendly! Combine sugar & butter in small sauce pan and simmer until syrupy. Pour mixture over bottom of 9 x 13 baking dish. Slice bread into 1 inch slices, cut in half diagonally & place over syrup mixture. Put apple slices between bread slices. Zest a lemon over the bread In a bowl, beat together eggs, milk, salt & vanilla. Pour over bread. Sprinkle cinnamon over egg mixture. Cover dish and let stand in refrigerator overnight. Bake @350 degrees for 35-45 minutes. Try this healthy and tasty dessert during your holiday festivities. It’s a perfect make-ahead treat. Line an 8×8-inch baking pan with foil. Sprinkle cereal evenly on the bottom of the pan; set aside. Place yogurt, strawberries and condensed milk in a blender; cover and blend until smooth. Pour the mixture over top of cereal, gently smoothing yogurt mixture to edges of pan. Cover with foil (or plastic wrap) and freeze for 8 hours or until firm. Use edges of foil to loosen and remove from pan; let recipe thaw for 5 to 10 minutes. Cut into squares, top with whipped topping, if desired, and serve. Storage tip: Squares may be individually wrapped and frozen for single servings. Note: Create your own variations by using other flavor combinations of yogurt and fruit.